The moment we’ve all been waiting for is finally here. No, we’re not talking about the Game of Thrones trailer dropping. We’re talking about tech unicorn IPOs, with Lyft’s recent S-1 filing kicking it all off (check out our blog post on reviewing S-1s). With more companies slated to enter the public markets this year, it’ll be important to understand the IPO process, which we breakdown for you in this blog post. One of the telltale signs a company is pursuing an initial public offering is the hiring of an investment bank to lead the IPO process. Investment banks typically have years of IPO experience and also investor relationships that corporations may lack. Some investment bank responsibilities include preparation of financial statements, valuation, investor outreach, and book-running (the process of tracking information about investors interested in participating in the IPO). Hence, hiring an investment bank signals to the market that a startup is preparing to go public. As discussed, an IPO can be taxing on a startup, as it requires complying with securities laws and regulations, like the Securities Act of 1933 or Sarbanes-Oxley Act of 2002. Born out of those regulations, a company is required to file a registration form, commonly known as the S-1, in order to sell securities to the public. An S-1 is an initial registration form for new securities that is required by the SEC – for more information on what is in an S-1 and what to focus on, check out our blog post. As a first step, a company will confidentially submit a draft registration form to the SEC for review and comment. Recently, unicorns like Postmates and Uber have confirmed confidential S-1 filings with the SEC. Once a company has gone through a couple rounds of comments from the SEC, a company will publicly file an S-1. At this point in the IPO process, a company has signaled its firm commitment to pursue an initial public offering, and barring any extreme turns in the public markets, a company will likely list on a national exchange like the NYSE or Nasdaq. It is important to note here that the first S-1 filing will exclude the number of shares and the share price that will be offered to the public. However, this public filing will disclose detailed financial information and will give public investors a look under the hood of a company for the first time. After publicly filing the company’s S-1, the company, along with its investment bankers and lawyers, will go on a “road show.” An IPO road show is the presentation given to potential buyers. Management, bankers, and lawyers will travel the country presenting an investment deck to wealth managers, institutional investors like hedge funds, and other sophisticated buyers. It gives investment professionals direct access to management and allows them to ask key questions. Ultimately, the road show is meant to determine appetite for the security and at what price investors are willing to buy the IPO shares. Following the IPO road show, the investment bank will divvy up the total shares offered to the various investors and determine the final pricing of the shares. Subsequently, the company will complete the S-1 filing by filling in the number of shares to be offered and the price of the security. The SEC will then declare the S-1 effective, meaning the company has met all the disclosure requirements to sell shares to the public. After the SEC declares the S-1 effective, the company’s shares will officially begin trading (typically the next day) on the chosen national exchange. Trading is usually commemorated by the company ringing in the trading day on its exchange of choice. The first few days of trading are closely watched by the investor community as investors hope for an IPO pop in share price. In the event the newly-public shares trade below the IPO price, it may point to some fundamental weaknesses of the company or that the IPO was incorrectly priced. In the event the shares trade higher than the IPO price, the offering will be deemed a success, albeit having left money on the table for the company. An understanding of the above steps will help you keep track of the process and how close certain unicorns are to their IPO. Timing and speed of the IPO process will differ for each company, and certain companies may have fewer disclosures or an easier-to-understand business model that may speed up the process. In the event of severe market turbulence, IPOs may be delayed or postponed indefinitely even up until trading day. In the end, companies control their destiny and can pull out of the IPO process at any point. Everyone, please take your assigned seats — Intro to “How to Read an S-1” is now in session. In today’s class, we’ll be providing a brief overview of the primary IPO regulatory filing (or the “S-1” as it’s known in the securities world) and which sections of this document to focus your attention on. Given the slew of unicorns filing confidentially in recent months, it’s important to be familiar with this document for when these companies file publicly. 2019 may prove to be a banner year for initial public offerings, as more unicorns take steps towards the public markets. Within the last few months, we’ve seen Lyft, Uber, Postmates, and Slack confidentially file their IPO paperwork, along with Peloton, CloudFlare, and CrowdStrike hiring investment bankers as first steps in their IPO processes. As the public waits for these startups to publicly file their respective S-1, below is a brief how-to guide to help you tackle these documents. As the bull market charged into its ninth year in 2018, with the FAANG tech giants (Facebook, Apple, Amazon, Netflix and Alphabet’s Google) leading U.S. equities markets to record highs, many of us thought we would have seen stronger IPO activity. 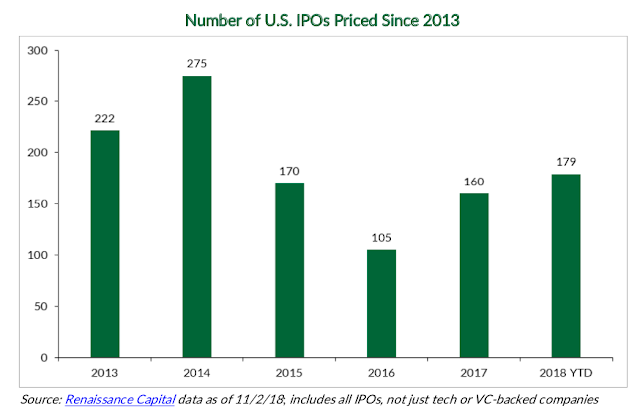 However, with under two months left of 2018 and despite favorable market conditions, this year’s U.S. IPO count is still nearly 100 IPOs lower than 2014’s total of 275 priced IPOs. At EquityZen, we continue to believe that IPO volume will remain subdued compared to prior bull markets given the secular trends we see in the U.S. capital markets. Our team at EquityZen took a closer look at the companies we believe are primed to go public in 2019. To read our full 2019 IPO Outlook, please click here.